Business customers with a planned upgrade to Windows 10 Enterprise for their work laptops, tablets or desktops may be at the mercy of their IT departments if they hope to use the new Microsoft Edge browser instead of Internet Explorer. Because IT managers have the option to delay deployment of new features or feature updates to users on Long Term Servicing Branch (LTSB), it wouldn't make sense for Microsoft to include the Edge browser, previously known as Project Spartan, on LTSB as the browser will constantly be updated. Edge's absence from Windows 10 Enterprise for LTSB customers was initially reported by Gartner and confirmed by ZDNet. 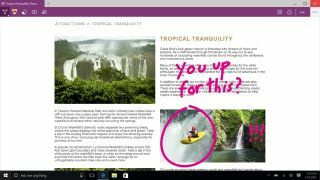 Microsoft Edge will make its debut on consumer editions of Windows 10, bringing with it the ability to ink, share and read content. The browser will come with deep Cortana integration to help users look up information quickly. A problem with segmenting Windows 10 Enterprise from the consumer edition of Windows 10 is that this creates fragmentation. Besides the fact that Microsoft Edge won't be available to Enterprise LTSB users, universal Store apps may or may not work on Windows 10 Enterprise as they get updated. "When LTSB starts out, all Universal Windows Apps should work, but as the 'modern half' of Windows evolves on the other branches, it won't change on an LTSB release," Gartner analyst Michael Silver said. "So at some point, Universal Windows Apps from the public (Windows) Store may not work on an older LTSB, even ones that used to work, because they may eventually be updated with new features that rely on updates to Windows." For businesses, this shouldn't be too big of a problem as it gives IT managers more control of how updates are deployed. IT managers can delay feature updates on LTSB for up to ten years. Additionally, because many verticals rely on customized desktop software, many of these tools may not have the Modern UI, or universal Store app, equivalent. However, problems may arise in the future as businesses begin upgrading to touch-based systems and two-in-one hybrid notebooks. With touch, Universal apps may make more sense and once businesses begin creating universal apps for their custom desktop software, compatibility must be accounted for with the Windows 10 Enterprise version available that IT managers deploy on LTSB. We still don't have much information about the launch of Windows 10 Enterprise. Microsoft previously confirmed that the consumer versions of the operating system – Windows 10 Home and Windows 10 Professional – will debut on July 29 starting at $129 (£85, AU$170).